As summer draws to a close, cooler overnight temperatures and timely weather fronts from the northwest are a harbinger of the days ahead. Fall is the season of plenty as berries, seeds and nuts come to fruition just in time to fatten migratory birds and resident mammals like deer, bears, squirrels and the like. For nature watchers there are no finer months than September and October to be out on the lake and the trails surrounding it. Bird migration through the park is at its peak and thousands of songbirds, waterbirds, birds of prey and even hummingbirds stop by on their way to the wintering grounds in Central and South America. Warblers put on an especially colorful show during the mornings following cold fronts. These tiny songbirds migrate at night and come to earth just before dawn to refuel on insects and water. The birch trees behind the Paddy’s Creek Area bathhouse have proven to be a reliable spot to enjoy many types of warblers as they hunt for moths, caterpillars, spiders and flies. Birders should try to be in position as early as possible to enjoy the show. The park gate opens at 7 a.m. Birds aren’t the only critters on the move. Some species of insects migrate too. Monarch butterflies are perhaps the best known of these, as the entire population heads to a specific mountaintop in northern Mexico to spend the winter. 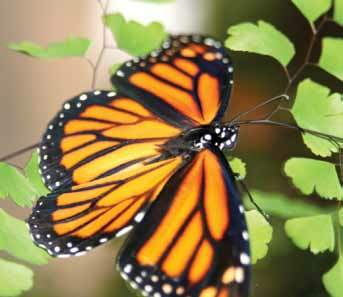 Organizations that follow the monarch life-cycle are predicting a good year for these colorful butterflies. Favorable weather conditions that started last spring have allowed a bumper crop of monarchs from across the Midwest and East Coast to embark on this perilous journey. Other insects that undertake seasonal movements (not necessarily north-to-south) include American lady butterflies, giant cloudless sulfur butterflies, Gulf frittilary butterflies, green darner dragonflies and other dragonfly species. Add all of these amazing and colorful travelers to the changing hues of the autumn leaves and a hike at Lake James State Park can be truly breathtaking. See you out on the trail!